JACKSON, CA – This year, Main Street Theatre Works (MSTW) celebrates its 15th Year at the beautiful Kennedy Mine Amphitheatre in Jackson. Kicking off their 2018 Summer Season, MSTW presents Mama Won’t Fly, by Jessie Jones, Nicholas Hope and Jamie Wooten, and directed by Allen Pontes, who brought you last year’s huge hit Doublewide, Texas, also by Jones, Hope & Wooten. 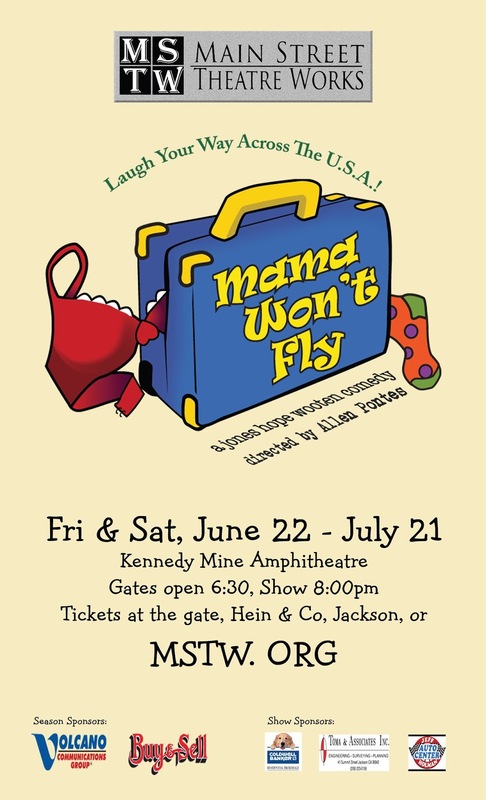 Mama Won’t Fly is a hilarious, family-friendly comedy, that will have you laughing your way across the USA. Savannah's brother is getting married in four days and she's trying to get Mama to the big day ~ from Alabama to California. But things get complicated when Mama won't fly. Amador local, Mitch Alaire plays feisty Mama Norleen Sprunt, who manipulates an unexpected road trip with her daughter Savannah (Kelley Ogden) and future daughter-in-law, Hayley (Janey Pintar). It’s a race against the clock, met with every conceiveable, and inconceivable mishap available, including a car theft, a near-fatal visit to the Underwear Museum, a hijacked eighteen-wheeler and a detour to Vegas that ends in a brawl with an ordained showgirl/minister. Over twenty different characters are played by five different actors (Amanda Aldrich, Lee Marie Kelly, Janet Motenko, Brandon Rapoza, & Scott Taylor) in this fast-paced tour across America. Mama Won’t Fly runs June 22nd - July 21st. The Kennedy Mine Amphitheatre is located on the Kennedy Mine property in Jackson, CA. Patrons walk past an old tailing wheel (used when the mine was in operation), across a bridge, and onto a grass-covered, terraced bowl. There the stage is set for picnicking and quality theatre under the stars. You are truly sitting on a gold mine. 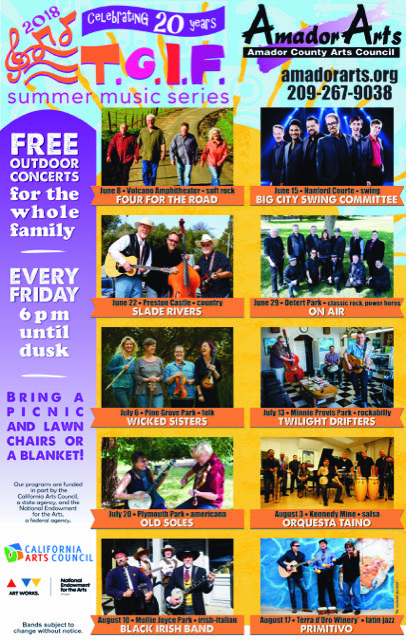 The summer tradition of going to free concerts every Friday evening in Amador County is about to begin. 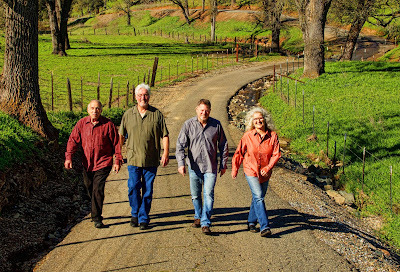 The first TGIF concert will be June 8, from 6 to 8 pm, in the Volcano Amphitheatre and will feature all-time favorites “Four For the Road.” This innovative, easy to enjoy band is comprised of Adam Gottstein on guitar, Joe Bellamy on keyboard, Allan Alexopulos on percussion, and Klaudia Promessi on woodwinds. Together, their sound is original whether they perform the songs they wrote or selected cover songs. This will be the 20th anniversary of AmadorArts putting on these concerts, so expect a line-up of great music reflective of the quality and longevity of this series. Surprises will be in store as the county celebrates this vibrant summer tradition. New bands to our community will be featured, in addition to highlighting excellence in local music. Starting June 8 and running until August 17, the concerts will move each week to a different outdoor park and feature a different band each time to deliver passion and excitement to your Friday evening outings. Be sure to be there if you have a goal of making it to ALL ten of this season’s concerts. The music starts at 6:00 pm, but people of all ages start to arrive earlier to set up picnics and to meet and chat with friends. This is, after all, the weekly fun thing to do for hundreds of Amador residents. Out-of-towners too have discovered TGIF as a great way to jump start a weekend in the foothills. AmadorArts, aka Amador County Arts Council, is the 36-year-old non-profit organization that also brings arts education to local schools and the community and acts as a regional catalyst for all the arts. 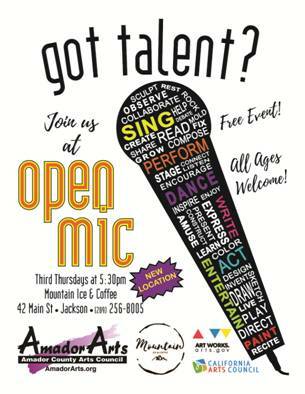 Everyone is welcome to perform at the Third Thursday Open Mic Night in Jackson. That’s May 17, from 5:30 to 7:30 pm at the recently-opened Mountain Ice & Coffee at 42 Main St. AmadorArts, presenters, hopes to see older semi-professional folks to jam and share at this one since many young people will be occupied on this night at a high school art show. Fine culinary arts will be present such as Temple Coffee, roasted in Sacramento, Dreyers Ice Cream, and Kneading Dough’s locally baked goods. who have entertainment gifts to share.